On the far side of the Taklamakan desert, Kashgar is another fabled city of the Silk Road in the extreme west part of China. In a rugged landscape of mountains and golden sands, Kashgar was an important trading hub and a contentious area within Central Asia during the 1800s as Russia and England played at empire building. Nearby the Khunjerab pass, the 1400 meter high route through the mountains to Pakistan, is the link from China to the West. Layered in legend, the narrow winding streets of the old town kadimi shahr are lined with mud-brick houses and life seems not to have changed over the centuries amid the sounds of donkey carts and the call to prayer from the central Id Kah Mosque. An important gathering place for the area's predominantly Muslim population, the courtyards, trees and reflecting pool make it a refreshing stop. Traditional craft workshops are scattered about the area. The flavor of the Middle East and a whirlwind of languages color the atmosphere here and you can almost believe that you are not still in China. The warm, open friendliness of the people here welcomes you in with hot tea and soft round bread right out of the clay oven. Try the Uygur specialty of crisp noodles and Xinjiang rice. Sample the melons, figs and grapes ripened in desert soils and watered with glacial runoff. Visit the 2,000 year-old Kashgar market for ethnic silks, Kashgar and Hotan carpets, famous Yingisha knives, copper teapots and hats of all shapes and sizes. There are twenty different sections, so bargain hard! 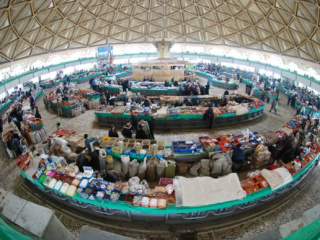 Thousands of farmers and nomads from surrounding areas and traders from Pakistan and Kazakhstan come to the Sunday market. At the livestock market frenetic bargaining for sheep, horses, yaks and camels make this a "must-see" for travelers to Kashgar. The tomb of Abakh Khoja is a lovely series of Islamic structures covered in glazed tiles and surrounded by poplar trees and built in 1640. 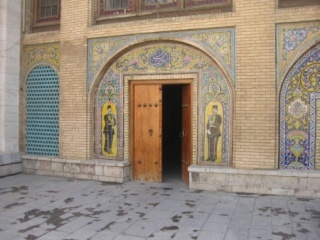 Inside the main hall are the many tombs of the Abakh Khoja family, all covered in silk and satin fabrics. According to legend, alongside this family lies the tomb of the Uygur Fragrant Concubine of the Emperor Quianlong. Several hours outside of the city Lake Karakul reflects Mount Muztagata on its surface. The surrounding grassland is populated with flocks of sheep and dotted with Kyrgyz yurts and guesthouses. You can hike the area or take a boat or camel ride to enjoy the views. Genghis Khan captured Kashgar in the 13th century; let it capture your imagination now.